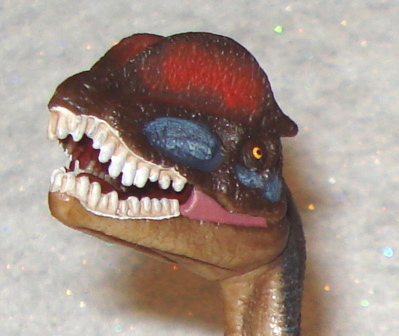 The Safari Dilophosaurus brings realism to a new level. 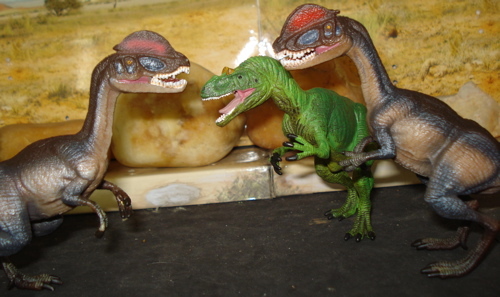 a pair of the 2008 Dilophosaurus) and such interesting choices as the 2008 Scutosaurus. All in a new and very realistic mold. 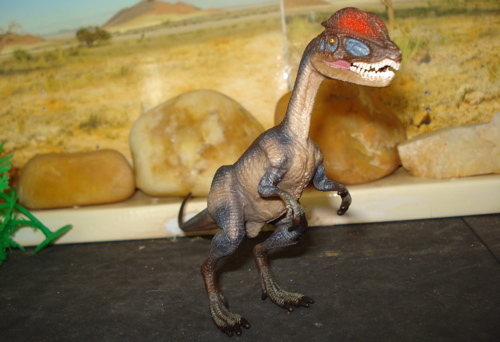 2008 saw the introduction of the Dilophosaurus by Safari Ltd. 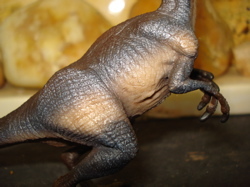 This Dinosaur (first named in 1954) had really gotten its introduction to the world as the frilled "Spitter" in the 1993 Jurassic Park movie. 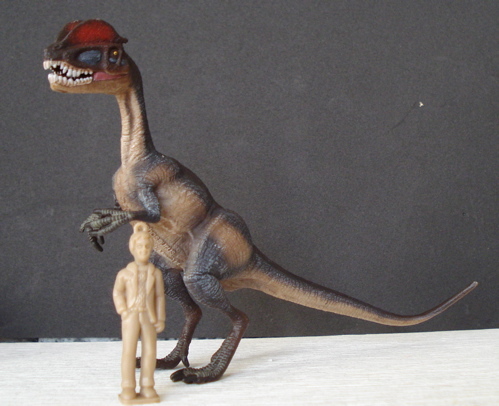 In the movie the Dilophosaurus was small (about three feet tall and five feet long) but in its own time it stood eight feet and was ~20 feet long, weighing half a ton. 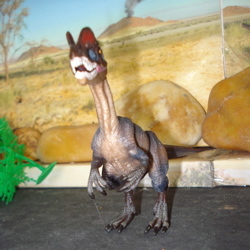 It was THE apex predator of its time, the late Triassic, 190+mya. 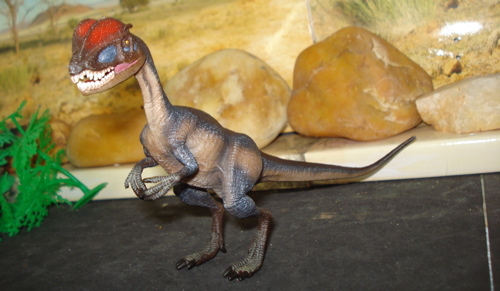 Since 1993 there have been a variety of other rather nice Dilophosaurus Dinosaur toys produced including an actual 'spitter' (you can fill it with water and squeeze), at least one unbranded from China, a pair from Carnegie (1993, now OOP) and Schleich, among others. 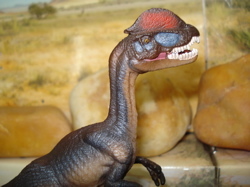 The Dilophosaurus has become very popular and even common in the Dinosaur toy box. Pretty good for somebody who started out with nothing but teeth and claws 200 million years ago and didn't even get named until 1954. 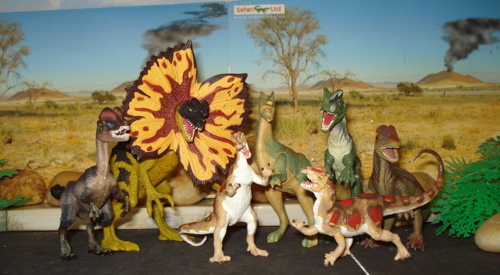 Above, l-r: Safari, Chap-Mei, China, JP & Schleich, Carnegie two in front. 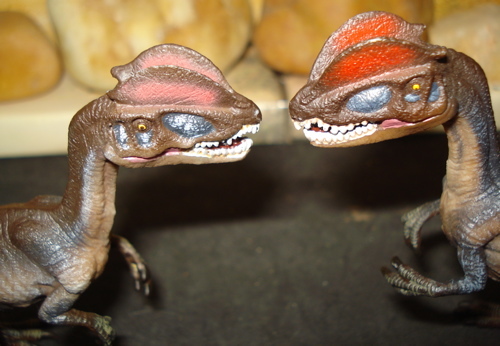 All in all the Dilophosaurus is one of the earliest and least known of the Theropods. 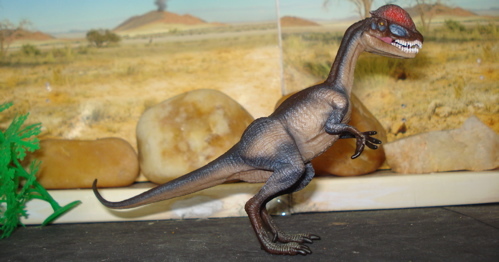 It is related to the mildly bizarre Antarctic Cryolophosaurus. But relatives can be fickle. 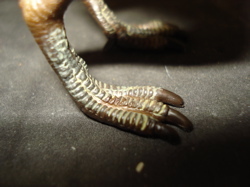 Its relatively loose jaws have led some paleontologists to believe that it was a scavenger (the teeth/jaws being too weak to hold on to and bring down large game) while, more popularly it is thought that it used its claws and its teeth to bring down its dinner. The crests on its head, two in parallel, are also somewhat of a mystery and are thought to be secondary sexual characteristics. Used for display and attraction. Or not. We really don't know. 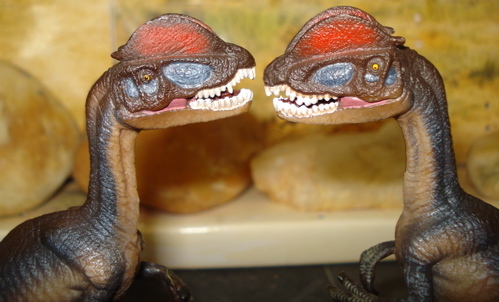 They do make for great looking Dinosaur toys, however, and we're very glad that they had them. If they did. Which is what we think. upright and leaning back a bit on its heels, searching for prey. "Where is that Jurassic Park hot-dog vendor?" 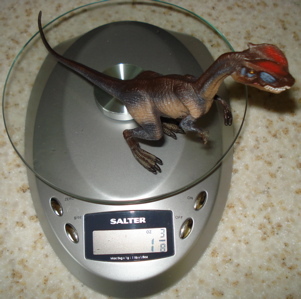 Weighing in at one and three-eighth ounces (1.375oz, 40gms) and at eight and a quarter inches (8,25", 21cms) in length this little terror is ~1/30 scale. 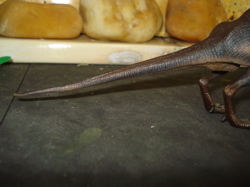 Given the paucity of fossil remains our size estimates (~20 feet and 1000 lbs) could be wildly off and this figure fits in very well with the general run of 1/40 scale figures from Bullyland, PAPO, the Safari Carnegie Collection (opens new window) and Schleich among others. 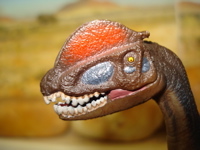 A face only a Dinosaur Toys Collector could love. 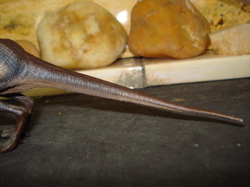 brown on the upper surfaces and a light, pale brown on the lower jaw. 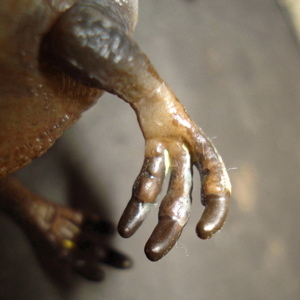 The attention to detail doesn't end with the head, however, and continues down the neck and throat (above), and into the forepaws (right) where the darkly colored claws are clearly detailed and quite ready to rend and tear. 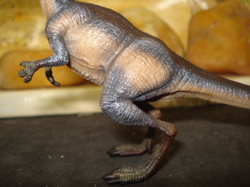 Those forearms (forelegs?) are held out in front of the body, elbows bent and wrists curved in an active, ready position. You can readily imagine this little guy (or the big guy he's based on) reaching out to touch someone tasty. 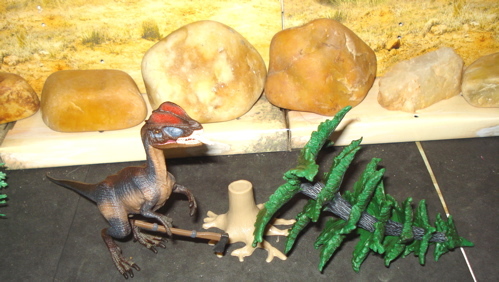 Below we see the conclusion of a typical early Jurassic period hunt. "Hey punk! Your lunch money or you're lunch, sonny." the bones (i.e, ribs) and musculature beneath the skin. The skin texture itself seems to be based on that of modern-day pachyderms, with a sense of being quite rough, deeply creased with folds and stretched over the powerful musculature. From the tip of its nose (above) to the feet(s) and the tip of its tail (below), the sculpture flows, one part into the next. 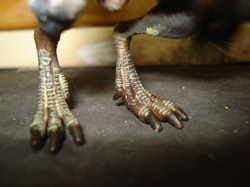 The feet, unsurprisingly, are quite bird-like in appearance (above). 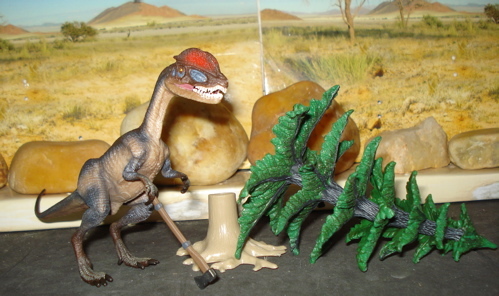 "Who chopped down my favorite tree?" A disclaimer: In case you haven't noticed yet, I really like this figure. 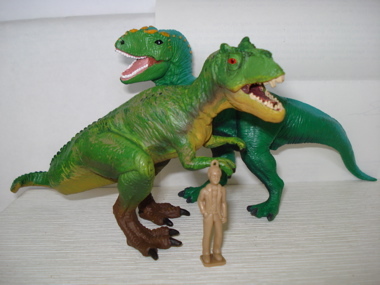 It is exemplary of what contemporary Dinosaur Toys can be and offer in both educational and fun value. add a certain level of havoc in, say, the local schoolyard. "We don't need no edge-ication. "WE don't need no thought control... hack, hack, cough...."
from the Safari-factory folks! Individually handpainted. Cool. 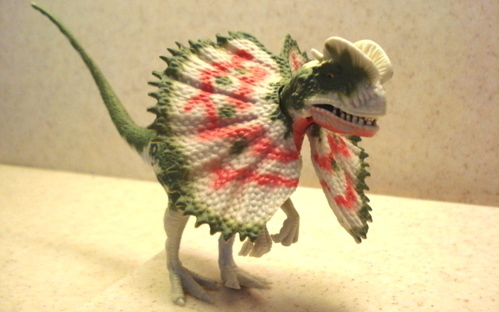 Coming at ya', the Dilophosaurus chaaaaarge! looking up at the belly (above) we can see the high degree of detail on the bottoms of the feet (it's always heavenly to see detailed soles), the throat and underpart of the jaw. 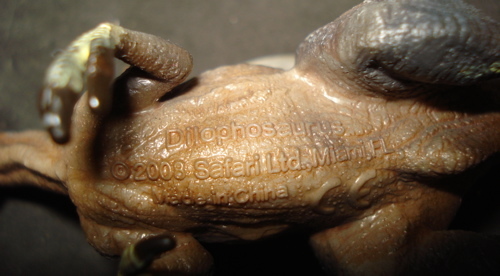 "DILOPHOSAURUS Safari Ltd, Miami FL, Made in China" and the now ubiquitous "CE" honoring the European Union regulators. 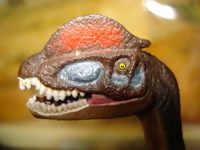 The Dilophosaurus is one of the more popular Dinosaur toys out today. It is produced by almost all the major manufacturers since it was first introduced to the world in its big (Jurassic Park) movie debut back in 1993. 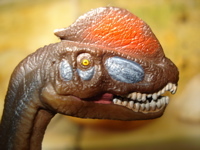 Following is a list of at least some of the Dilophosaurus toys that are currently extant. 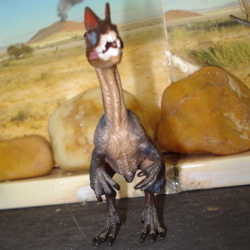 Luckily for you the Safari Dilophosaurus is available for purchase almost anywhere that you'd care to look. From Amazon to eBay and specifically at the Safari website (opens new window) ranging in price from $7.25 to $9.99. Always plus tax and shipping. 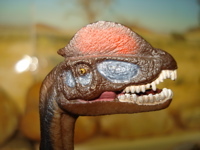 You can't avoid the tax but you can avoid the shipping by going to your neighborhood Dinosaur Specialty Shoppe (WHAT!! Your neighborhood doesn't have one?) and pick it up for the usual song. I would suggest you get several (I have four) because hunting in packs is more fun (and profitable) than hunting solo. I suppose, given sales tax levels, you'll end-up putting out a sawbuck for each of these. They are worth it! 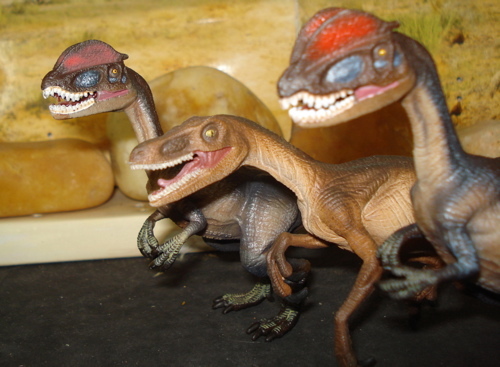 I'd also pick up a couple of the 2007 Safari Velociraptors as well. They're well out of scale but you won't care. These have undergone all the government regulated toxin testing you can imagine (and afford) and have passed them all, earning the European Union's wonderful award and symbol of subservience, the "CE." They are safe to eat but too much fun to play with and at their cheapest cost $136/pound, like Kobe beef. But they don't taste that good. These are safe for little kids but, (and I speak as a loving parent and grandparent,) are way too good for little kids. Let the little ones play with the packaging and lumps from the 1990s. 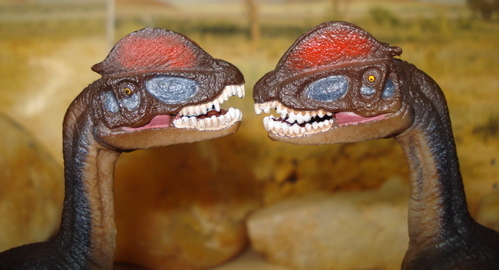 Save the good stuff, like these Dilophosaurs, for yourself. 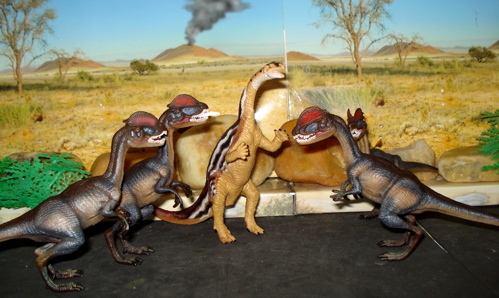 As of today, these are the class of the Dilophosaur Dinosaur toy act. Best in breed so to speak. 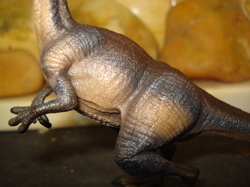 Taking everything into consideration these are great Dinosaur toys, replicas or museum-quality sculptures. You decide. Mine hang around the computer snapping up ideas I happen to let drop. 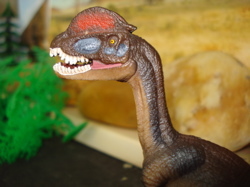 You have been reading about the Safari Dilophosaurus, an early Jurassic Theropod. 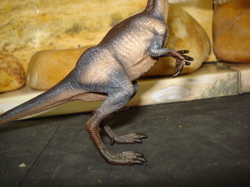 You can read all about other Theropods here, if you wish to click. Below, we see the pack getting involved in Hi-Tech. "I don't know, but it's pretty sharp." "Yeah? 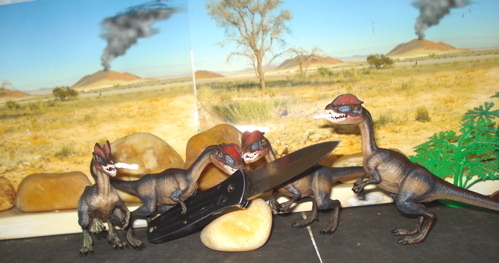 Well it's not as sharp as I am." "No, no, no. Not as sharp as me!" "ME!!!" "No ME!" "ME... me...me...me...."
I want to thank Safari Ltd for their help in the creation of this page. You drive me Wild Safari!